Knowing when to plant hollyhock and calendula seeds can mean the difference between a bright cottage garden full of blossoms this season or waiting until next year to enjoy the show. You have to know a little about these old fashioned favorites to properly plan when to plant hollyhock and calendula seeds. Both calendula and hollyhocks are flowers used frequently in cottage garden styles. They are equally at home in your garden and your grandmother's garden. Hollyhocks grow quite tall, usually in the range of several feet, while calendula are a more modest 12 to 18 inches tall, depending upon the variety. Both flowers come in a wide variety of colors. Hollyhocks may be found in many colors ranging from whites, yellows, pinks and dark burgundy, while calendula favor the orange and yellow end of the spectrum. Like many flowers, hollyhocks and calendulas both require full sun and prefer rich, well-drained soil. Hollyhock and calendula seeds require different conditions to germinate. Hollyhock seeds may be started outdoors or indoors, but do best when sown directly into the garden soil where you'd like them to grow. Choose your spot wisely. Traditional varieties grow three to four feet tall, while dwarf varieties still get at least a foot tall. Plant traditional hollyhock varieties towards the back of the garden bed. In many gardens, you'll find hollyhocks growing along a fence line. They add additional beauty and color to screen the fence, while the fence acts as a support for their tall, top-heavy blossoms. Hollyhocks require rich, well-drained soil, so be sure to amend the garden soil with lots of compost before sowing your seeds. They need full, bright sunlight too, so make sure that the spot chosen for your hollyhocks will receive at least six hours of direct sunshine daily. There are two times of year that hollyhock seeds may be planted in most gardening zones: spring and fall. The recommended planting time is fall. 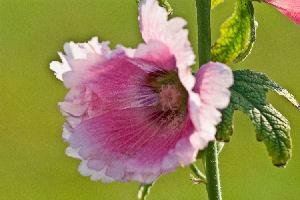 If you plant seeds in the fall, hollyhocks have a good chance of blossoming in the next year. If you plant the seeds in the spring, you may have to wait a full year before you see blooms. In gardening zones 6 through 8, plant hollyhock seeds February through March or September through October. They need temperatures around 59 to 68 degrees Fahrenheit in order to germinate. Be sure to leave the seeds on the surface of the soil, or just sprinkle them very lightly with soil or compost. Hollyhock seeds need light in order to germinate, so if you plant them too deeply, they won't sprout. Calendula seeds are slightly different from hollyhock seeds. While it's recommended that you plant hollyhocks outdoors, calendula may be started indoors or outdoors, and many gardeners prefer to give them a head start growing in flats under lights inside before transplanting them to the garden. Sow calendula seeds indoors March through April, depending on your garden zone. Garden zones 7 and higher can sow seeds in March to set plants outdoors in May, while zones 6 and lower should start seeds later, sometime in April. Sprinkle the seeds in flats of seed starting mix, covering lightly with soil. Place a plastic dome or plastic bag over the seed trays to maintain humidity and keep the room temperatures around 65 to 70 to encourage germination.Once the seeds have a few sets of leaves, they may be transplanted into the garden as long as it is past the frost free date for your gardening zone. It's important to harden off calendula plants. Hardening off means to gradually acclimate the plants to outdoor conditions. To harden off seedlings, bring the seed trays outside and set them in a sunny area for about two weeks, taking them inside or into a sheltered spot at night. As long as the temperatures don't dip too far below 65, the seedlings should be fine. At the end of the hardening off period, they're used to the outdoors and stand a better chance of success. Don't worry if you've forgotten to start calendula seeds inside. They can be directly sown into the garden once all danger of a hard frost is past, usually sometime in late April. As with indoor seed sowing, sprinkle the seeds into the soil, add a thin layer on top, and keep moist until they germinate. Hollyhocks are such an old-fashioned variety and so easy to collect seeds from that you may be able to get some free seeds from neighbors, friends, or free seed exchanges. You can find many different types of hollyhock seeds ranging from Victorian beauties to modern hybrids at your local garden center, large home and garden stores, and even mass merchandisers such as WalMart and K Mart. Calendula seeds are also plentiful and easy to obtain. Online sources include Thompson and Morgan, Park Seed, Burpee and the many other seed catalogs.